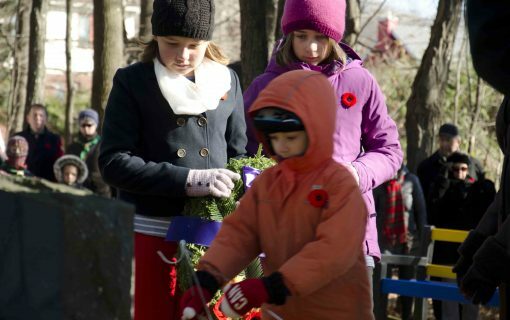 Three school children from Chelsea Quebec, Cecily Adderley, Lucy Sinclair and Duncan Anderson assisted Juno Beach Centre Board member, Meriel Bradford, with laying a wreath on behalf of the Juno Beach Centre at the Remembrance Day ceremony organized by the Gatineau Valley Historical Society. The young people prepared for the event by meeting after school to discuss Remembrance Day, the sacrifice of Canadian military members and the importance of the values of liberty and freedom we enjoy today. A small rural community in West Quebec, the area lost several residents in the Boer War, WW1 and WW2 who are commemorated on plaques in the Pioneer Cemetery. Cecily, Duncan and Lucy preparing to lay the wreath. Photo courtesy of The Low Down to Hull Back News. Duncan and his dad, a Canadian Forces member, showing their respect. Laying the Juno Beach Centre wreath.